Next week I am planning to try out two new recipes on the eve of Durga Puja. One of them would be a sweet dish and the other one would be most likely a savory. So please eagerly wait for them. For the moment, let me share a fun food dessert. I made this for my son’s 9th birthday party and all the kids loved it. Oreo cookies and cake pops both are kid’s favorite and so I thought they would be delighted if they get both at the same time. I started looking for recipes of cake pops made out of Oreo cookies. When I finished making it, was wondering why I didn’t prepare this treat before. The procedure was so easy and went very smoothly. The Cake pop is a form of cake that looks more like a lollipop. 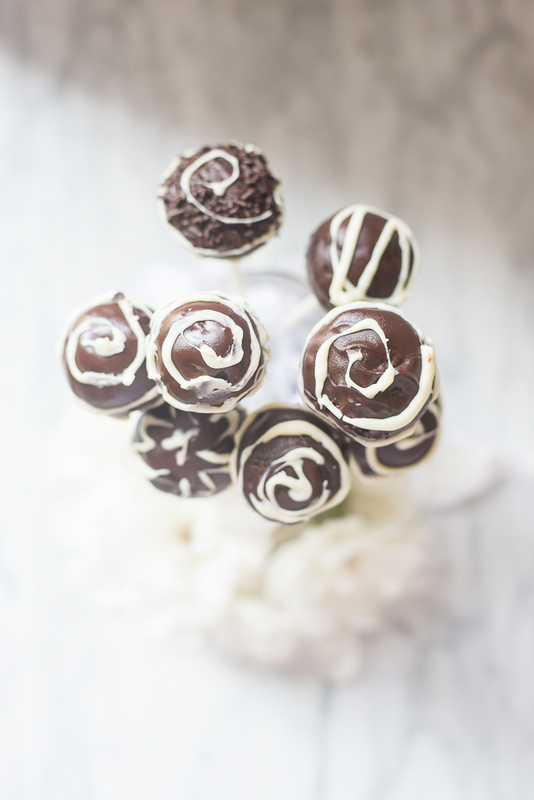 It’s very nice idea to get a makeover of leftover cake by making these delicious pops. The first step of the recipe is to mix cake crumbs with icing and form small balls. Then put a layer of coating, probably of chocolate or any other decoration that you like. Adding chocolate on top makes it look more beautiful and attractive to the Kids. The recipe that I am sharing today for Cake pops will take much lesser time from you compared to others. 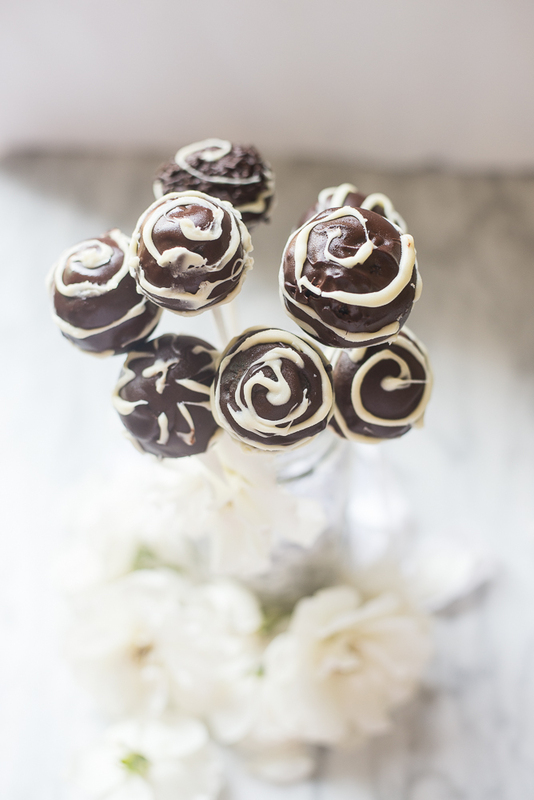 Mainly because it is a no-bake cake pop. Since you don’t need to bake a cake, it cuts the preparation time drastically. That’s why when I found this recipe, I just jumped out of excitement and gave it a try. 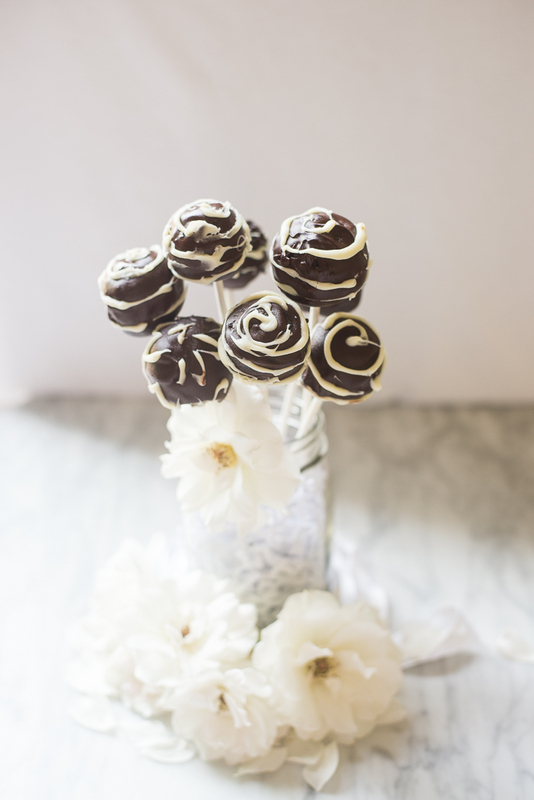 Hope you and your kids will love this yummy tasty and delicious Cake pops. Cream Cheese : 3/4 of the package, around 5 oz. Ghirardelli Semi-sweet chocolate chips : 2 and 1/2 cups. 1. Use a food processor or a blender to crumble the cookies. You can put the cookies in a large ziplock bag and use a hard object to crush the cookies as finely as possible. 2. Take a bowl, add Oreo crumbles and cream cheese. Mix it well and make a dough. 3. Chill the dough in the refrigerator for about 30 minutes. 4. Roll the dough into 1.5 inch balls. Make about 20 balls. 5. In a small microwave-safe bowl, add 1/4 cup of the semisweet chocolate chips and a half teaspoon of the shortening. Cook it in the microwave for one minute. Remove and stir until smooth. Dip one end of each lollipop stick into the melted chocolate and poke sticks into the Oreo balls. Keep them in the refrigerator for about 30 minutes. 6. Now take a microwave-safe cup , add remaining semi-sweet chocolate chips and the shortening. Microwave for about 2 minutes. Check the bowl and stir. If chocolate is not melted, again cook it in the microwave. Check every 30 seconds to avoid burning. Stir until smooth. 7. Dip the balls into melted chocolate. Turning the stick to ensure even coverage. Allow the excess to drip off. 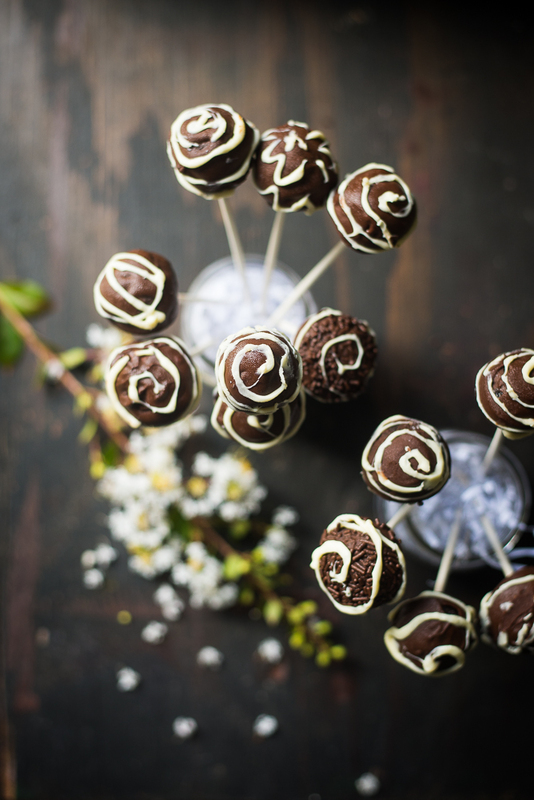 Use a block of styrofoam as a holder to stick the cake pops in while they are drying. 8. In a small microwave-safe bowl, heat the Ghirardelli white chocolate chips for one minute. Stir until smooth. 9. 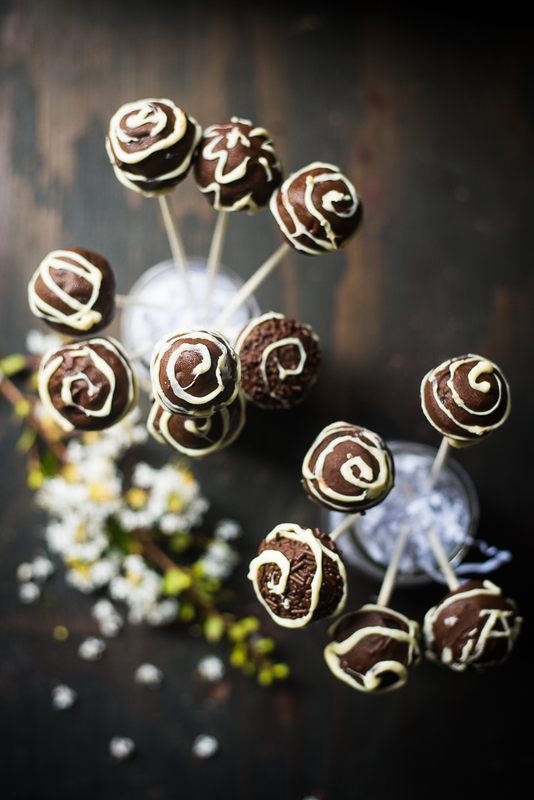 Once the cake pops are just set, drizzle with melted white chocolate. Let's stand for 30 minutes or it is set. Transfer them to an airtight container and refrigerate for up to one week.